In 2014 over 200,000 Christian and other religiously distinct pilgrims wanting to experience a life altering journey, set out from starting points across Europe, to make their way towards Santiago de Compostela via the Camino De Santiago. Pilgrims have been walking the Camino de Santiago following the path to Santiago de Compostela and the tomb of St James for centuries, whether for spiritual reasons, motivation to self- dicover their human resistance and perseverance or simply seeking out endless adventure the Way of St. James. It is known to globe trotters as one of the ultimate pilgrimages; this destination, the Cathedral of Santiago de Compostela is located in the north-western part of Spain called Galicia, interestingly enough this is actually the part of Spain where my family is actually from. According to historians and a legend or two, the remains of the apostle, Saint James the Great, are buried at the Cathedral of Santiago de Compostela in Galicia.The Camino Francés (French route) has been slated as the most common route to the shrine of St. James the apostle, but there are also active Spanish and Portuguese that lead to the Cathedral. The Way of St. James was one of the most important Christian pilgrimages during the Middle Ages, together with those to Rome and Jerusalem; spiritual retreat, is one of the main reasons so many believers in the Christian faith take this route, on a quest to seek out growth in their spirituality. The earliest recorded visits to the shrine of St. James at Santiago de Compostela date back to the 9th century, in the time of the Kingdom of Asturias. The pilgrimage to the shrine became the most renowned and highly traveled during the Middle Ages, but when the Black Death, Protestant Reformation, and political unrest of the 16th century hit Europe, it led to a decline of tourists seeking out the journey. That was until the 1980s, when the route started to attract pilgrims once again from around the world. In fact, in 1987 the route was declared the first European Cultural Route by the Council of Europe and named one of UNESCO’s World Heritage Sites. Y Fact: The scallop shell (often found on the shores in Galicia) has become the symbol of the Camino de Santiago. The shell has taken on this paradigm of mythical, metaphorical and practical meanings, which has met at the customary tradition for those returning home from their pilgrimage, to take with them a souvenir shell as proof of their journey’s completion. It was an April morning, in the midst of a crisp West Coast Spring when I boarded the most fretful flight of my life. It was a Los Angeles bound to Miami flight, a route I will never forget, because the entire five and a half hours were bursting with pockets of abrupt and constant turbulence. Thankfully, the universe sat a young man beside me who helped distract me, from what I thought would be my worst nightmare. Yogi Roth is a Filmmaker, a New York Times Best-Selling Author, and quite the popular Sports Analyst. Via his passion for inspiring others and traveling the globe, Yogi embarked on a journey that changed his life forever. When he started to share this story with me, his zeal for the path he took was so telling of his innate willingness to project understanding, kindness and self-worth, that I knew it would be the perfect story to share with each and every one of you especially during the Holiday Season. 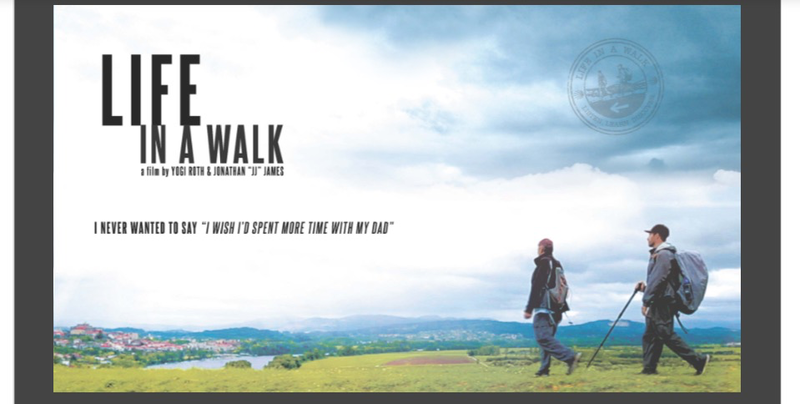 Yogi Directed and Executive Produced a Documentary called ‘Life In A Walk’ about his journey with his father, along Europe’s Camino De Santiago. ‘Life In A Walk’ has become a movement about sharing simple joys with the people that we love. Yogi listened to, learned from and discovers more about his father than he ever imagined during the journey, but before I started to ask any questions, I just had to know.. Y he wanted to embark on this particular Camino? With a quick gasp for air, Yogi began… “I have always been an adventurer my whole life, an explorer and I have always loved traveling. I caught the bug when I was 22 and haven’t stopped going since. I was kind of seeking that next trip, and as I was seeking it, I started to talk to my peers about, LIFE. You know, you kind of hit the phase when you start to get older and they all said the same thing, they had all of these questions that were unanswered. Yogi was simultaneously shooting a travel show and when he mentioned wanting to shoot this documentary with his Dad to the production company, everyone at GATHR Films got on the same page with Yogi. Before they knew it, Will and Yogi were headed to Spain, with a small crew of two cinematographers, who completed the walk alongside them, filming all the way. For those who don’t know, Yogi what is the Camino De Santiago? “It is one of the most famous pilgrimages in the world, for centuries and centuries. It started as a religious pilgrimage and you would walk the original route from France, you would walk all the way through France and Spain and you would get to Campo De Santiago, which is like the Seattle of Spain, in the Northwest corner. Over the past 30 years it kind of picked up some steam and it went from a religious walk, to a spiritual walk. The journey to learn from his Dad was a theme strewn throughout the film, and one that Millennials can definitely connect with. Y’s have maybe more interesting relationships with their parents than other generations ever did. Learning the lessons Yogi did, are simultaneously simple and inspiring integral parts of the journey… So I asked Yogi, what was the biggest lesson he had learned? “That’s a great question. Well, this journey changed me to my cellular level. The walk changed me and the process of making the film changed me. I learned things on the walk, such as just enjoying the simple joys in life. You know a big part of me, like many Millennials, I think that we are in a cultural race. We are trained that when we finish college it’s the internship, to the job, to the promotion, to the next chapter of the promotion and now we are running a company, right? We want to do things differently, we want to think out of the box, we never sleep and I was caught up in that; I was going from audition to audition and job to job… I didn’t feel like I was always there… I wasn’t as connected as I needed to be and that is what I think I learned on that trip. It is easy to do it when you are in the middle of nowhere and I recognize that, but when I got back I started to really look at my footage with our team, that is when I continued to get influenced. Sharing is exactly what Yogi did, he took this moment in time to bond with the man who was always his Father and would now become his friend. Our chat with Yogi’s Dad, Will Roth was so inspiring, that it all started to make sense to us too. I wondered what Will thought this journey had done for the relationship between Father and Son, I can only imagine that it just being the two of you together for a few weeks on a trip like that with all of the emotions going on, it must have been a real bonding experience? Interestingly I completely knew where Will was coming from, because it’s not common to meet a group of people on the same journey and although you have differing motivations for Y and how you got there, somehow maybe their journey can help you on yours. Did you find that to be true, Mr. Roth? Honestly, it makes me want to take on the Camino too; With his wisdom shinning through, I asked if Mr. Roth had any advice for young people, who are trying to find themselves? “My Suggestion, learn to learn, love to learn! Whether you make the big dollars or not isn’t the issue, if you are learning and you have learned how to learn, no matter what you are doing you will have a good quality of life. You either have time or money, my father would say you won’t have both, and I was blessed to have time. Besides the walk, it was truly a journey in itself to make this 76 Minute film. I was interested in hearing Yogi’s thoughts about the effort and campaign, which took place to help make this film come to fruition? “We were kind of self-funding it ourselves and I took it into the group that I work with and… Indiegogo said this is exactly why Indiegogo was created, this will resonate with people on a deep scale… We went on Indiegogo and Day 1 we were in USAToday and Day 40 we were in Men’s Health and we raised over 50 grand! The coolest part about that was, from Day 1 I heard from people and my team heard from people, in multiple continents and countries, countless cities and towns around the globe that didn’t just know me as a college football analyst or storyteller, but didn’t know me at all.. BUT, they related to the story! Yogi grew up in the small town of Dalton, Pennsylvania with 25 hundred people and no stoplights, he went on to share with me how vulnerable he and his dad had felt at the inception of the project, but when they started to hear the feedback from folks across all walks of life, on how their journey had helped them, it all started to make sense. “In our movie, we manage to start the conversation of the subtle movement, around the idea of spending time with the people that you really love. I really think that our movie is a simple story, and while it is about my dad and I, I hope that you get lost in that story and you miss elements of the film and you just think about your life… I know this from being at 50 plus screens around the country and we have been from Alaska to Sarasota, and everywhere in between, that our movie is having some change in that conversation” Said Yogi. The ‘Life In A Walk’ documentary has received an incredible reception, but I wondered if it was expected or if it had superseded Yogi’s expectations in any way? “Yes and No. I have big expectations, once we went for it, it was let’s go!… Where I have been blown away is how deep it has gotten into people’s hearts. To me, I expected it to have an influence, I don’t know if I was ready for the impact that it had on people. I think that it is simple, because there is not a lot of conversation around it, that is about just walking and we all can walk, without going to Spain or Portugal on some exotic trip. It could be walking around the block and where in we walk, just like my dad says in the film, ‘You walk through things in life’. How can we bring ‘Life In A Walk’ to our cities? “We started with our partner named Gather, it was really cool, because a lot of movies as you know, specifically Docs get a week in the theater, maybe two at the most… I wanted to give back to the people who supported our story (Indiegogo campaign) and Gather allowed us to do that. Literally, you go to our website, put your zip code and put your name in and you just show up.. as long as you can bring in 20 people or 30 people to a theater. The Holidays may seem like a challenge to get people to sit down and spend time watching television, but the thing about this film is… it will elicit amazing conversation, understanding and growth within your family circle. This message is precisely, what the Holiday season is all about! 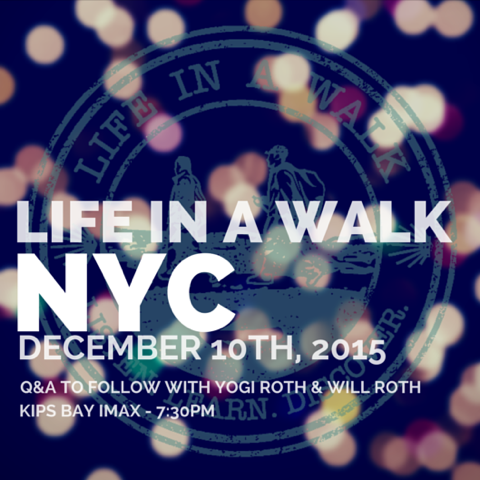 If you happen to be in New York City tonight and want to catch a screening of the film, along with getting to ask Yogi and Mr. Roth some questions of your own, head on over to the Kips Bay IMAX and catch a screening of LIFE IN A WALK! Click Here for More Information on tonight’s screening!